KAMPALA – Changing weather patterns in Uganda are making it difficult for farmers to plan their planting seasons. Previously the weather pattern indicated two good planting seasons; March to May and September to November. However, nowadays, rainfall sometimes continues throughout what were known to be dry seasons while prolonged dry spells are also experienced in the rainy seasons. This, therefore, calls for use of more efficient water-management technologies such as advanced irrigation systems alongside using agricultural research to develop crops that are resistant to climate change. For example, scientists in Uganda and elsewhere in Africa are studying the use of beneficial microbes from soil to strengthen plant resilience to drought, diseases and pests brought about by climate change. 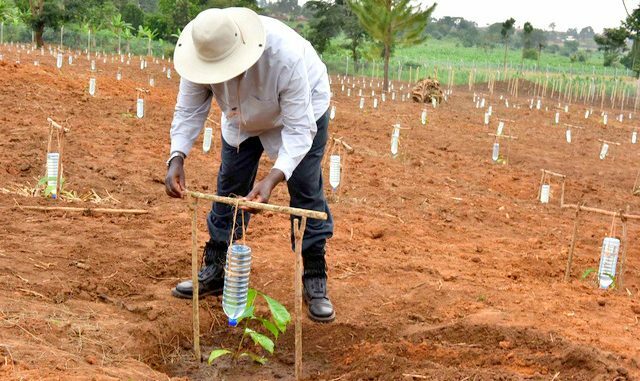 Mr. Simon Alibu, an agronomist from the National Crop Resources Research Institute (NaCRRI) in Namulonge, says adopting irrigation is very crucial now that we have suffered effects of climate change in terms of prolonged dry spells. 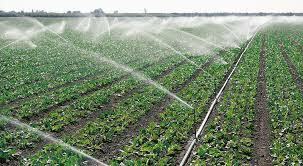 There are various types of irrigation technology; flood irrigation, where water channels are constructed near a water spring to allow free flow to the farm; drip irrigation where plastic pipes are laid all through the field at an interval of 30cm and the seed is planted where the drip hole is located, and sprinkler irrigation, which can be moved around the field. Farmers growing rice at Doho Irrigation scheme in eastern Uganda have benefited from flood irrigation because they can grow rice throughout the year. But for farmers in places with no source of water, irrigation becomes difficult, a reason Mr. Alibu says they should carry out rainwater harvesting and build underground dams. He also advises farmers to practice irrigation using the simplest methods such as using watering cans. Mr. Andrew Kalema Ndawula, a farming consultant who also practices irrigation in Nakaseke District, explains the modalities of irrigation on his farm, noting that he sprinkles water on the orchard plants; Bamboo and Prunus Africana from water drawn from a shallow well of about 100ft within the farm. Mr. Kalema digs channels, allowing water to flow through the field. The water is a collection of rain water catchment diverted from the main water running path which is stored underground in a water tank constructed within the farm. It has a capacity of 5,000 litres and can help in watering the plants for a period of one month. The managing director of Davis & Shirtliff Uganda Ltd, Mr Ephraim Wainaina, explains the importance of irrigation as means to curb climate change effects. The company deals in equipment such as motorised pumps, drip irrigation equipment. Mr. Wainana says they advocate for communities to purchase water machinery in order to practice irrigation during the dry season so that there is no shortage of food. SolarNow Uganda has introduced a portable solar water pump for smallholder farmers to help improve food security in the country. According to Mr. Andrew Bagenda, the company’s marketing manager, they discovered that many farmers have been affected by the current drought due to lack of affordable facilities for irrigation and decided to come up with a system to cater for smallholder farmers. He says the entire system costs about Shs2 million and can irrigate more than 300 meters of a flat piece of land. “If you cannot pay the whole amount at once the company allows for instalment payment upon depositing 15 per cent of the total amount. It is simple both in cost and technology because it does not use electricity or fuel. It draws water from the tank and irrigates the entire garden,” Mr. Bagenda adds. Apart from irrigation, an alternative method is the adoption of drought-tolerant crops which have been developed by scientists such as the water efficient maize varieties. Others are early maturing varieties.